Just early last month, we did an article on cars' air intake systems to allow you guys to have a better understanding of it. What we didn't mention, unfortunately, was what particular air intake system would be good for your car, especially if you are the breakneck motoring kind and keen to mod your wheels. This time round, we backtrack a little to advice more about the air intake filtering system. Generally, for a good air intake to provide more air to the combustion chamber to produce more power and energy, the air filter must come into play because it is an important part of a car's intake system, as it is through the air filter that the engine "breathes". An engine requires an exact mixture of fuel and air in order to run, and all of the air enters the system through the air filter first. The air filter's job is to filter out dirt and other foreign particles in the air, preventing them from entering the system and possibly damaging the engine. What are some of the air filters in the market? The market is flooded with many different types of performance air filters and intake systems and more often than not, manufacturers claim that their product is much more superior to the rest. We reckon it all depends on what kind of air filters you decide to go for. We take a quick look at some of the common air filters available in the market. 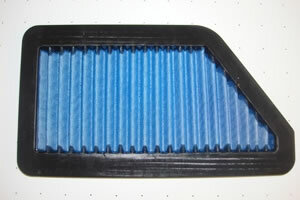 A paper filter is a common choice for automobile engine air cleaners, because it is efficient and cost-effective. The filter papers are transformed into filter cartridges, which will then be fitted to a holder. The construction of the cartridges mostly requires that the paper is stiff enough to be self supporting. Paper filters are hassle-free with no cleaning or oiling required. However, they are non-reusable as they need to be replaced every 15,000km to 30,000km (depending on the model of your car). Plus, its low dust tolerance will cause particles to accumulate which will result in higher airflow resistance. Looking almost identical to the set up of a paper air filter, a cotton gauze filter is fitted and enclosed to a holder. However, unlike paper filters, the cotton gauze filter is reusable, making it a very economical and lasting air filter. And although it is priced slightly higher than paper filters, it increases your car's performance by 1 to 2 bhp with no modification required. However, it can be a tad troublesome to maintain. In order to sustain the efficiency, owners must constantly clean and oil the filter properly. If the filter is over oiled, the oil may affect the accuracy of the MAF sensor (mass airflow sensor) preventing it from injecting the correct amount of fuel into the combustion chamber. Similarly, if the filter does not get the sufficient oil it needs, the efficiency of the air filter will be compromised. Employed in a small number of aftermarket air filters marketed as high performance items, an open pod filter (cotton gauze) is usually a round casing that houses the cotton gauze as filter. In the past, cotton gauze saw limited use in stock automotive air filters. Depending on the car's air intake system, this air filter enables motoring breaknecks to enjoy a marginal gain in performance accompanied by a sportier and louder exhaust note. More importantly, good filtering efficiency is experienced under the bonnet with this air filter which allows for superior air flow effectiveness. However, like all filters, this has its cons as well. Some modifications need to be done to remove the stock airbox to have this filter installed. Additionally, it has a low dust load up efficiency, resulting in higher airflow resistance. Thus, constant cleaning and oiling must be done to maintain its efficiency. An open pod filter (foam) is usually a round casing that houses the foam material as filter. It was widely used in air cleaners on small engines such as lawnmowers and other power equipment in the past, but automotive-type paper filter elements have largely supplanted oil-wetted foam in these applications. Not only does it provide good filtering efficiency, it has a good dust load up tolerance which enables superior air flow efficiency. And because oiling isn't required, there isn't much to worry about the jamming of the MAF sensor. Like most filters, regular cleaning must be done to maintain its efficiency. In terms of performance gains, the increment of horsepower depends on your car's air intake system while revs are smoother at higher rpm. Apart from being a tad sluggish at low speed and having a possibility that you'll lose your low-end torque, it also needs some modifications to the stock airbox to have it installed. The oil bath filter consists of a pan of oil, over which an insert of different materials such as fiber, paper or mesh was fitted. This was used in vehicles until the introduction of paper filters in the sixties. The way it was set up made incoming air flow rapidly over and around a serious of turns. The air must take a turn at high velocity over the oil pool where the heavy elements of the air contaminants would be unable to make it and thus be captured by the pool of oil. From there the lighter particles that did make it over the oil were captured by the insert. The oil bath filter isn't popular and is considered obsolete because it is a hassle to change. Using thick open-cell reticulated foam that's clad fully in black plastic, cold air charging filter is an air filter that has a unique external air drawn construction. It is a combination of short ram air intake and cold air intake system. Its unique capsule design, acting like an enclosed air box, isolates the placement of the foam filter. Furthermore, directly inducting cold air from outside the engine bay ensures only cool air is fed into the combustion chambers of your engine, which leads to an increment of your car's horsepower by 10% to 15%. Short ram air intake is a form of aftermarket air intake that replaces the stock air intake with a short metal or plastic tube leading to a conical air filter inside the engine bay. With the increased airflow and reduced covering, intake noise is usually increased, which may manifest as a sucking sound, and the loss of any silencing properties that the factory intake had. 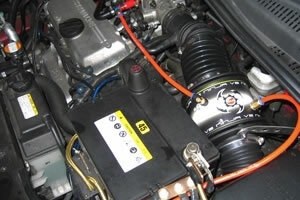 That said, it is able to improve the fuel efficiency of a car. A cold air intake comes in many different styles and can be constructed from plastic, metal, rubber (silicone) or composite materials such as fiberglass or carbon fiber. It is a system used to bring down the temperature of the air going into a car for the purpose of increasing the power of the internal-combustion engine. A secondary goal is to increase the appeal of a car by changing the appearance of a car's engine bay and creating an attractive intake noise. 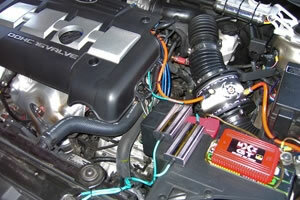 However, like the short ram air intake, the intake noise of a cold air intake system is usually increased. 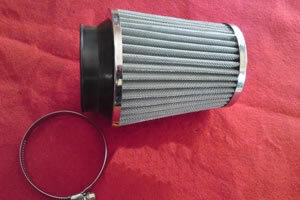 So what is the recommended air intake filtering system? We reckon the Ninja Racing Capsule Filter has been proven to be the most effective air intake filtering system in the market and is highly recommended. Available in two variants, depending on the displacement capacity of your car, the sophisticated design of the second generation of Ninja Capsule Filter drives air in the filter to experience various stages of transformations. Allowing full utilisation of its unique characteristics of air as it flows through, the Capsule Filter maximises efficiency in delivering the ultimate power to your car. Dubbed the Ninja V2 (for Normal Aspirated engine up to 2500cc and Turbo-charged car below 1300cc) and the Ninja V2-X (for Turbo-charged cars, V6/V8 or large capacity engine up to 3500cc), the latest Ninja Capsule Filter incorporates a second air source for more airflow and more power. It also acts as an air pressure regulator, maintaining higher air pressure during a relaxing drive (low rpm driving) and lower air pressure when you step on the accelerator hard for a more enthusiastic drive (high rpm driving). 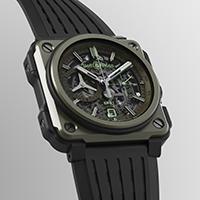 With Ninja V2, there's no need to sacrifice low-end torque. By achieving the right air pressure during different rpm levels, its power is on tap with all-round efficiency while effectively functioning as a fuel saving device. The Ninja Racing Capsule Filter uses reticulated polyester foam filtering element. This allows the filter to have the highest dust load up tolerance, preventing accumulated dust from blocking the air passageway of the foam. This special dry flow foam is made of unique polyester foam. It needs no oiling between cleanings which can result in clogging the MAF sensor caused by oil traveling up the inlet. This results in owners being able to maintain the air filter in a fuss-free manner while not risking over oiling the air filter that could potentially void their vehicles' warranty. And that's not all. Ninja Racing Capsule Filter is fully-compliance with the LTA regulations on vehicle modification, ensuring that standards for road safety and vehicle exhaust gas and noise emissions are not compromised. It is also user-friendly. As it can be fitted into any vehicle running on gasoline, there is not a need for complicated modification to your vehicle and no reprogramming of ECU is required. More importantly, your original air filter set-up will not be cut or damaged, making reverting back to original easy. Plus, unlike some of the air intake filter systems in the market, Ninja Racing warrants their consumers with a Life Time Warranty to ensure that the product purchased is 100% free from manufacturing defects. With the durable (full aluminum) construction, Ninja Racing Capsule Filter will simply outlive the lifespan of your car. Browse the 106 Racing & Motorsports Equipment merchants in our motor directory.